I just love strawberry rhubarb pie, just rhubarb pie. When I was a little girl, my mom would make a rhubarb sauce that we would poor over vanilla ice cream. Man it was so good, your mouth would water just thinking about it, or at least mine does still to this day. I have been told a couple of different times that I needed to be gluten free because my body could not digest the protein gluten. I tried back in the early 80’s but everything tasted like the cardboard box, coated with some sort of plastic and gave up after a year of trying. I have been trying to go completely gluten free since 2009. I continued to find that the foods prepared for commercial marketing lack taste and do not take into consideration the combination of foods some of us can not eat for one reason or another, my other problem food is sugar, and most combinations of sugars our other foods break down to. So I make things from scratch Sometimes they end up being dogie treats for my service dog, Dee, and some times I come up with something really good. Below find the recipe and step by step instructions for making this gluten, sugar free strawberry, rhubarb pie! Just add your favorite topping, beverage or memory of eating rhubarb pie and you have the perfect relaxing winter day. The first pie was made with sugar free Jello strawberry flavored, but once I noticed it had aspartame in it, I chose to just add some tapioca flour to the fruit mix for a thickening agent on the second and finale pie I baked. The crust is like a shortbread crust, very light and flavor full. The first fruit mix was just delicious, sweet and tart at the same time. I ate the whole pie, and decided that I didn’t need to use the Jello, as it does contain aspartame and apparently the taste of the aspartame was addictive to me. The second pie was not nearly as sweet as the first pie but it did have a nice balance between sweet and tart, but it could have had more of a jelly type sauce like the canned fruit for pies or even when cooking with refined sugar. Steveia does not become syrupy when heated, I would suggest adding some Knox gelatin to thicken it appropriately. Adding tapioca is an old trick, but if the fruit and sugar do not make a syrup like liquid the pie will seem dry and the fruit will look more leathery and less inviting. That is how my pie turned out, and below is the recipe for the one with the Jello in it. Cut butter into flours, until crumbly. Add about 1/4 cup water one tablespoon at a time, working dough with hands until a soft ball forms. 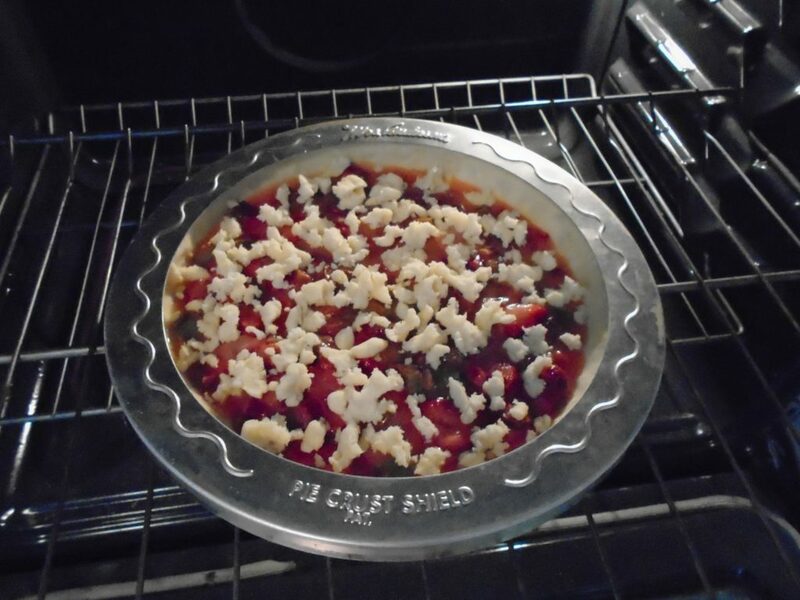 Place dough in a 8 inch pie pan and press out and up sides. Fill with fruit mixture. 1 1/2 cup fresh or frozen Rhubarb chopped small. 1 pkg Sugar free Strawberry flavored Jello 0.60 oz. 2 Heaping Tablespoons Stevia, almost 1/4 cup. If using frozen fruit let defrost in Stevia and jello powders. Stir and add to pie crust. Preheat oven to 400 degrees and bake pie about 1 hour. The one thing I did not like about using the Jello is that it contains Aspartame. Some people have a funny reaction to Aspartame, so if you choose not to use the Jello, you can add tapioca to the mixture, about 1 Tablespoon to help thicken the fruit mixture. The Jello pie has a little more flavor, and a better filling jell, I think it could be achieved using Knox gelatin, but I haven’t tried it yet. Give this a try and let me know what you think. And remember, Keep on Crafting Montana!